Whether your company is a highly caffeinated startup, a small gift boutique, or a large law firm, good manners at work are important because they emphasize your willingness to control your behavior for the benefit of others. Business etiquette is vitally important for creating a harmonious work environment and for representing your company in the best manner possible. Although many people consider their technical skills and intelligence to be their most important job qualifications, many employers consider the ability to get along well with colleagues and clients even more important. Being well mannered means two things above all else: respecting others and treating people with courtesy and kindness. Acting with grace and tact is also crucial within your workplace. Your considerate behavior in the office and with clients makes a big impression; it’s instantly recognizable and beneficial to both you and to your company. When a courteous employee works with others, including his peers, staff, and superiors, his grace lends an air of professionalism to the workplace that others emulate and that employers reward. Being a well-mannered business professional is harder than memorizing a bunch of stuffy rules. The greatest challenge is to incorporate the rules of good behavior so readily that you don’t have to think about them at all. As a representative of your company, you stand not only for yourself, but also for the company as a whole. If you are poised, courteous, and respectful to your company’s clients, they will extend their approving judgment to other employees of your company. If you are inconsiderate, insolent, and rude to your company’s clients, you will be out of a job soon. Acting with grace and tact is also crucial within your workplace. Would you like to learn more about Business Etiquette and professional speaking from the professionals in the field? We offer seminars and events for the general public, large and small business, schools and individuals. We also offer train-the -trainer etiquette programs and private consultations. Or contact us (805.975.9511) or one of our Etiquette Survival Consultant’s near you for a customized program. 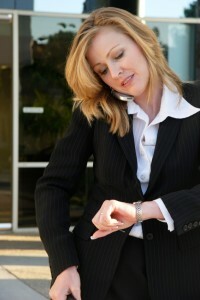 The business world can be quite overwhelming, even if you never leave the office. When entertaining enters into the business mix, it’s easy to get confused about what is appropriate and what is not. The goal of mixing business with pleasure is to create a warm social atmosphere even with the necessary business undertones. Business entertaining is a way to foster personal trust and confidence in others and is the fastest-growing way to do business. Knowing how to entertain clients on the golf course, or making deals over lunches and cocktail receptions, being in your best business form at any social situation really pays off. 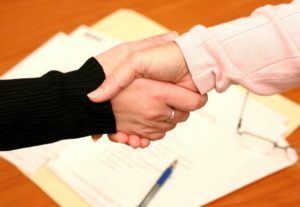 Think about inviting your clients to your home to foster a business relationship and rapport. 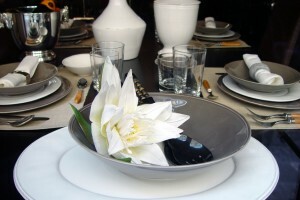 Table manners can also make the difference between closing that business deal or not. Fortunately, old habits can be changed if you want to change them; all it takes is some effort. 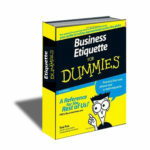 To learn more about Business and Social Entertaining visit our online store for our guidebooks, manuals, and DVD’s or pick up a copy of Business Etiquette For Dummies. You can also contact us for an upcoming workshop or custom seminar for your company by calling 805.975.9511. The need for etiquette has not disappeared just because we live and do business differently than we did thirty years ago! There is so much competition in the job market today, that young adults need every skill they can acquire. Our Etiquette Survival consultants have successfully completed the etiquette-training program developed by Sue Fox and Linda Cain. Etiquette Survival consultants have established independent etiquette consulting businesses throughout the United States, Canada, and internationally. Each consultant is trained and specializes in a particular area of etiquette, such as; Business Etiquette, Etiquette For Children, Wedding Etiquette, Social Etiquette, and Image Consulting. And, many specialize in all these areas, as well as providing training for other personal and professional development. Consultants conduct etiquette seminars and classes for professionals, small business, corporations, private organizations, K-12 schools, colleges, and the general public. New etiquette products, lesson plans, and student materials are continually developed and made available to all our Etiquette Survival consultants. To learn more about our consultants click on “Find a Consultant” and and locate someone near you! Start an etiquette business in your community today! Etiquette Survival® is pleased to provide products and teaching tools for etiquette consultants, individual use, in-house trainers, teachers or anyone looking to supplement their income or simply those with a passion to bring civility back into our world! A combined 20 years experience in the etiquette field and much market research and thought have gone into our products to make them simple to use, yet interesting and challenging enough for both the instructor and students. We know you will agree! Learn how to conduct etiquette seminars and classes for professionals, small business, corporations, K-12 schools, colleges, and the general public! Call us for more information: 805.975.9511. For Dummies is the world’s bestselling reference series, with loyal customers around the world and near universal name recognition. There are currently more than 160 million books in print, and more than 1,800 topics. The For Dummies series enriches people’s lives by making knowledge accessible in a fun and easy way. Described by the New York Times as “more than a publishing phenomenon, but a sign of the times,” the For Dummies series span every section of the bookstore, covering everything from health to history, music to math, sports to self-help, technology to travel, and more. The For Dummies brand franchise has expanded with an extensive licensed product line, including DVDs, software, consumer electronics, cooking, cleaning and automotive products, craft and hobby kits, games and more. For more information, visit www.Dummies.com or www.amazon.com, search books by title. Order a product or products today to receive one of our Etiquette Games absolutely free!